Warning: The drinking of hot or staining liquids while reading this book is not recommended. ROS made me laugh out loud. A lot. And I mean spit-take worthy eruptions of laughter. I usually don't seek humor in my book selections, but DeTarsio's style as a reviewer on Reader Unboxed gave me the push to give her prose a try. And, wow, am I glad I did. I knew I was in for something special when I clicked my Kindle page button at the end of chapter one. Chapter two is uniquely hilarious. I'll leave it at that. It's was pure fun to be inside the mind of Micki Cramer, the heroine. It was like being with a hilarious best friend on an otherworldly adventure. DeTarsio's take on Ros the alien herself seems beside the point during the early going. But as the plot thickens, and the bonds of friendship between Micki and Ros tighten, DeTarsio uses the fugitive extraterrestrial character to explore some pretty deep stuff. Although the book never takes itself too seriously, I was surprised and interested when Micki and Ros explore issues both meta-physical and existential. Fear not, for humor is never far behind, as one such scene culminates hilariously in an illegally-induced euphoric group sing-along of Journey's Lovin', Touchin', Squeezin'. I also feel I should mention the excellent editing. This book is amazingly free of errors and formating-issues, something often lacking in eBooks these days. 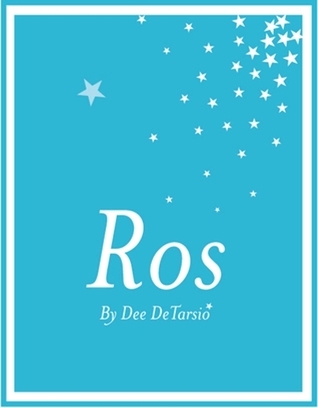 Whether you think you're looking for a funny book or not, give ROS a go. You'll be hooked. And laughter is good for the soul. You can thank me later. Sign into Goodreads to see if any of your friends have read Ros.